Can you believe we're getting so close? 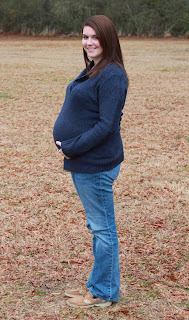 One of my best presents came Christmas morning when Owen and I reached 30 weeks! 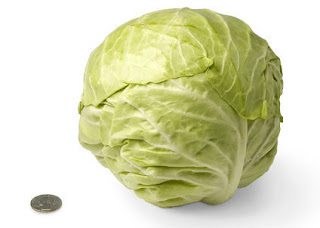 As you can see in my comparison, this big guy is now the size of a head of cabbage. And if his recent ultrasound measurements are correct, it's a really BIG head of cabbage! At my 28-week checkup I had gained a total of 12 pounds, but I'm thinking the holidays pushed that number up. I also took my one-hour glucose scan for gestational diabetes that day and apparently that Coke I had for breakfast did not help. I failed miserably and came back the next day to drink that oh-so-delicious glucose punch and have blood drawn every hour for three hours. Harry, Ron, and Hermione helped the time fly by, but it wasn't exactly a fun experience. I thankfully received a call saying everything was normal and no daily blood sugar checks were in my immediate future. Whew! Other than that, I'm getting more uncomfortable by the minute, Owen is trying to escape in a way nature did not intend, and I'm still loving every second. :) Pregnancy is so amazing and I am thankful to be able to enjoy it a second time. I'm cherishing the time this little guy spends in there and I'm counting down the days until we meet face to face! Yep, you're a pro now :-).